Sean Spicer finally got to meet the pope. The former White House press secretary attended an audience with Pope Francis Sunday as part of an annual meeting of the International Catholic Legislators Network, Vatican spokesman Greg Burke confirmed Tuesday. A photograph posted on the Vatican Radio's English Facebook page from the event shows Spicer sitting in the front row, taking photos of the pope with his phone. Others show a man dropping to his knee and proposing to his girlfriend during the audience. Photos released on the Vatican's photo service site also showed Spicer with his family following the meeting greeting the pope and shaking hands briefly. The Pontiff is seen smiling with his family and blessing Spicer's wife and children. 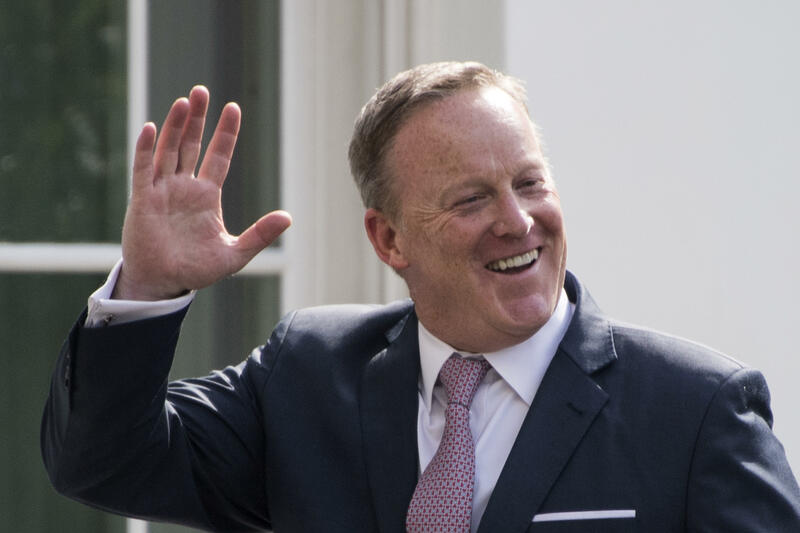 Spicer, who is Roman Catholic, had been left off a list of White House officials who had the chance to meet with Francis in May when Mr. Trump visited the Vatican. The omission struck many as a slight by Mr. Trump against the embattled aide and drew sympathy on social media. Spicer announced his resignation last month, but remains on the White House payroll through the end of August. In announcing the audience Sunday morning, the Vatican press office said the pope gave a "brief greeting" to the 250 or so participants gathered in the Clementine Hall, one of the main reception rooms in the Apostolic Palace. It didn't release the full text of his remarks, but both Vatican Radio and the Vatican newspaper, L'Osservatore Romano, said the pope delivered a message that included his usual call for lawmakers to "build bridges" between different political perspectives. Mr. Trump criticized the pope during his 2016 presidential campaign after Francis said that anyone who wants to build a wall -- as Mr. Trump had promised to do along the southern border with Mexico -- was "not Christian." Mr. Trump responded by slamming the pope as a "very political" person who didn't understand the situation. The two appeared to bury the hatchet during their May meeting, when the pope joked with first lady Melania Trump about what she was feeding her husband. Spicer and the White House did not immediately respond requests for comment about the visit. The International Catholic Legislators Network is a network of Catholic lawmakers created in 2010 by the archbishop of Vienna, Cardinal Christoph Schoenborn and David Alton, a Catholic member of the House of Lords. Recently, it has seen huge growth in Africa. The group's annual meeting brings together lawmakers from across the world to discuss the promotion of Christian principles in politics. It's unclear whether Spicer is a member. In an interview with Vatican Radio on the eve of the audience, Schoenborn said both Francis and Emeritus Pope Benedict XVI had met with the group and encouraged its members. He characterized them as men and women "who want to be involved in politics as believers" but often find themselves as minorities. "These Catholic legislators find great encouragement from the church for their work, because very often they feel rather alone in their parliaments and in difficult situations" he said.